After a whirlwind that was UFC 203, a week later, the UFC is back in action in Hidalgo, Texas. Headlining the card is a pair of Lightweight contenders in Dustin Poirier and Michael Johnson. For Poirier, he comes into this bout on four-fight win streak, three of which come via finish. Another victory here and Poirier is looking at a top five bout, which is crazy given he returned to the Lightweight division in April of 2015. As for his combatant Johnson, he will look to end a two-fight skid (One in which is super controversial). It’s unusual matchmaking in the sense that one guy is on a four-fight win streak and the other is on a two-fight losing streak, but nevertheless it’s a great fight and opportunity for Michael Johnson to get back in the thick of the Lightweight division. Co-Headlining is a showdown in the Middleweight division between Derek Brunson and Uriah Hall. Brunson, is on the heels of a four-fight win streak, with the last three coming via TKO. Hall, will look to get back into the win column after falling to defeat at the hands of Middleweight contender Robert Whittaker. A win for either will obviously elevate them to a bigger fight, but more so, a win for Brunson has him cracking a stacked top ten. Anyways let’s just get to the predictions! 155 lbs. : Dustin Poirier vs. Michael Johnson – This fight is kind of peculiar, in that Dustin Poirier enters this contest on a four-fight win streak and Michael Johnson is on a two-fight losing streak. Matchup-wise though, it’s a great fight and one that’s going to be exciting. As I mentioned before, Poirier is on a tear right now. Ever since returning to lightweight, he’s looked like a serious contender. It can be said, that cutting down to 145 lb. was physically draining him and his talent. His combatant Johnson comes into this fight, desperately in need of a victory. His last fight came against Nate Diaz, in which both put on a scrap, but Diaz got the nod. It was his second defeat in a row, but then again, it really isn’t. If you recall, at UFC Fight Night 73, Beneil Dariush got the controversial nod against Michael Johnson. It was pretty clear that Johnson should of been awarded the victory, but the judges thought otherwise. However, Johnson enters this contest with a huge opportunity to get back into the thick of things. As for how this one is going down, I have two thoughts roaming in my head. One, Poirier is going be calculated and technical, picking his shots here-and-there en route to an early stoppage victory. Two, Michael Johnson withstands the early punishment and takes over as the fight heads into the later rounds. And, it’s a real possibility neither of these two things remotely happen, but I’m going with the first thought. Poirier via TKO! 185 lbs. 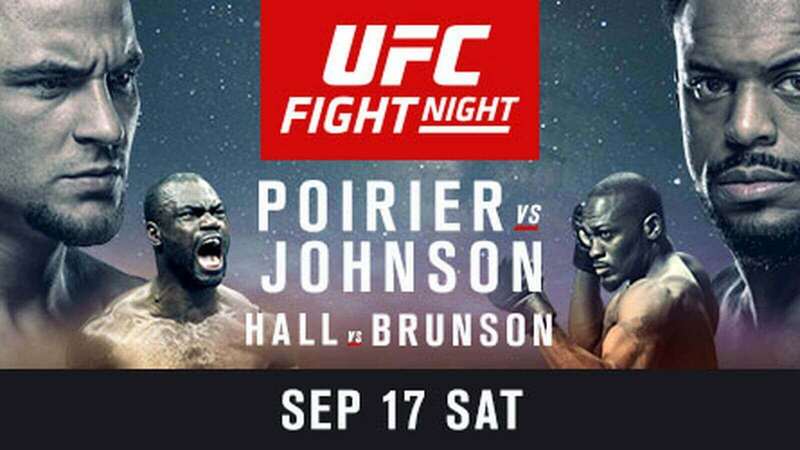 : Uriah Hall vs. Derek Brunson – Great matchmaking on this card, as this is going to be a battle in the Middleweight division. Brunson, who strives as grappler, has really been starching people on the feet of late. It’s made him more dangerous, hence the four-fight win streak. Also, Brunson was arguably a round away from defeating Yoel Romero, who is talked about as being a title contender. As for his combatant Hall, it’s been almost a year since he’s been out of action. And originally, he was set to face Anderson Silva at UFC 198, which as we knoe never happened due to Anderson Silva needing gall bladder surgery. However, Hall returns and he look to erase his defeat to Robert Whittaker back at UFC 193. As for a prediction, this is a tough call. I’m just going to side with Uriah Hall, who I believe will use his length to keep Brunson from trying to take him down. And if he does in fact keep this upright, his dynamic striking is going to take over. So with that, I have Hall via late TKO. 155 lbs. : Evan Dunham vs. Rick Glenn – Originally Evan Dunham was set to face Abel Trujillo, but an injury forced Trujillo out. In steps the former World Series of Fighting Champion Rick Glenn, who will make his promotional debut. Now, I like Glenn’s skills and I think he’s capable of being a UFC talent. However, he’s facing a veteran in Evan Dunham, who has seen a career revival of late. Riding on a three-fight win streak, Dunham is slowly climbing back into the top ten. And if you told me that after Edson Barboza extended his losing streak to three in 2014, I would of told you are crazy. Anyways, I got Dunham via late TKO. 170 lbs. : Roan Carneiro vs. Kenny Robertson – Fun fight and just another one that’s going to come down to the judges. Carneiro is coming off first-round TKO defeat to Derek Brunson, which saw a six-fight win streak end. On the other hand, Robertson suffered a close split decision defeat to Ben Saunders, which snapped his his three-fight win streak. As for a prediction, I’m going to side with Robertson who I’d consider the better striker in a bout that their grappling probably nullifies each other. So with that, I got Robertson via decision. 155 lbs. : Chris Wade vs. Islam Makhachev – This is a coin-flip of a fight. Honestly, you have two wrestlers, who lack striking. So, I’m not going to dwelve into this one and just side with Chris Wade winning via decision. 145 lbs. : Maximo Blanco vs. Chas Skelly – Fun fight, as you have you’re classic striker verse grappler matchup here. Maximo Blanco, the striker, looks to get back into win column after seeing Luke Sanders end his three-fight win streak. His combatant Chas Skelly, the grappler, saw a win streak of four end at the hands of Darren Elkins. As for the prediction, I’m more inclined to go with Chas Skelly. He’s a tough grinder with good cardio, that lacks striking and IQ when to not strike. In other words, he’s too tough for his own good and it almost cost him against Kevin Souza. Now, Blanco is a dynamic striker and will make you pay on the feet. However, he susceptible to the takedown which plays right into Skelly’s game. Ughh…on a limb, I’m going with Blanco to keep this one upright and TKO Skelly. 145 lbs. : Gabriel Benitez vs. Sam Sicilia – Tough fight, as Benitez is one of those guys who’s not particularly great in one aspect, but he’s capable in each. He’ll stick around in the fight and overcome you in the later rounds with just a little more in the gas tank. As for his combatant Sam Sicilia, he’s more or less an all out brawler. He’ll swing for the fences early and then resort to his wrestling later when he fades. As for a prediction, I want to say Benitez by decision, but Sicilia’s power and wrestling abilities have me changing my mind. So with that, I got Sicilia via decision. 170 lbs. : Augusto Montano vs. Belal Muhammad – I’ve seen all I need to from Augusto Montano when he fought Cathal Pendred. He’s simply mediocre at best. As for Belal Muhammad, the former Titan FC Championship proved that he belongs in the UFC. In a tough debut fight against Alan Jouban, he got starched early and kept on coming, even pouring it on in the third round. This second trip to the Octagon should be fairly easy and result in a victory. So with that, I got Muhammad via TKO. 185 lbs. : Antonio Carlos Junior vs. Leonardo Augusto Guimaraes – Ever since Antonio Carlos Junior was coined the nickname “Shoeface”, he’s had two dismal fights. That ends here, as I have no idea who Leonardo Augusto Guimaraes is. So with that, I got Carlos Junior via submission. 135 lbs. : Joey Gomez vs. Jose Quinonez – I think one guy has legit power in his hands and the other has a sweet mustache. I’m going with the legit hands, which is Gomez…via TKO! 170 lbs. : Randy Brown vs. Erick Montano – No clue who Erick Montano is, other than he beat Sage Northcutt’s UFC 200 opponent Enrique Marin. Randy Brown, is a fighter that was discovered in Dana White’s show “Looking for a Fighter” and is 1-1 in the UFC. Considering I’ve seen him fight (personally his debut), I’m going to just side with him via decision. 135 lbs. : Albert Morales vs. Alejandro Perez – Don’t know who Albert Morales is, but I see he’s undefeated. However, this is a harsh way to make your debut. The TUF Latin America winner Alejandro Perez is no slouch and he’s already got three UFC victories to his name, including a big one over former WEC title challenger Scott Jorgensen. In other words, I have Perez via a dominant TKO victory.